I'm glad you all enjoyed Barbie's Vacation Pictures. You were right about Glitter Hair Barbie being the one not featured on my blog yet. 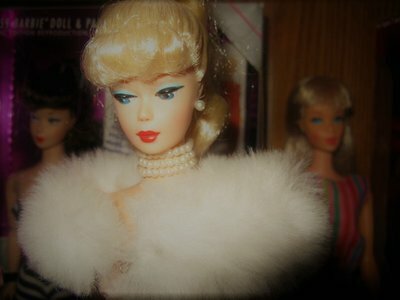 There is one more doll that I will feature but that will be my next post. I have a very special post for you today. But keeping in the theme of Easter, Avon put out two Barbie "eggs" which I have treasured over the years. I present to you the Countess of Rubies and the Empress of Emeralds. 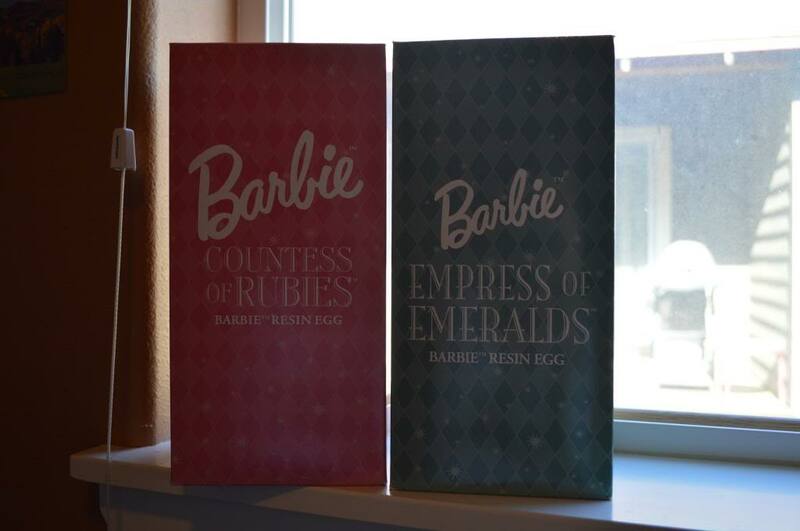 Barbie Resin Eggs. I know, you're dying to know what they look like. But first, a little history. You know my mom sold Avon (still does!) 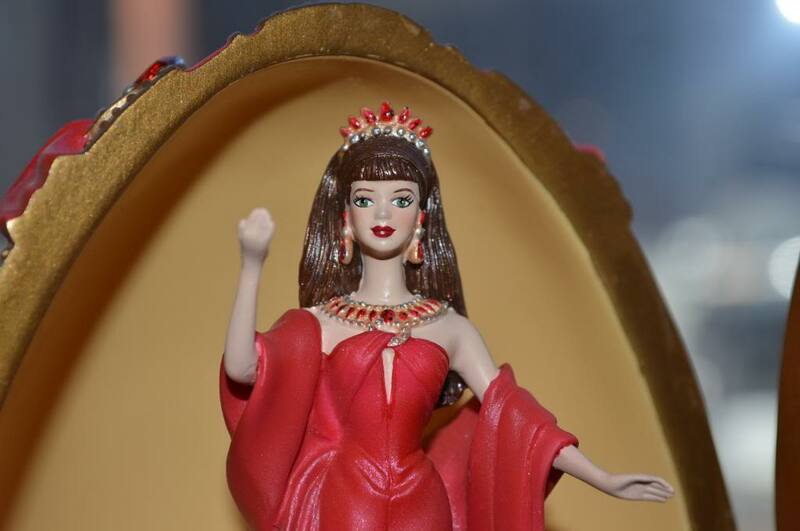 and she picked up these special treasures that Avon sold relating to Barbie. These are so so cool. Unfortunately these were the only two of the set. How cool would it have been to have, oh, the Duchess of Diamonds or the Princess of Pearls? But I am lucky to have these two. We start with the first in the series, the Empress of Emeralds. 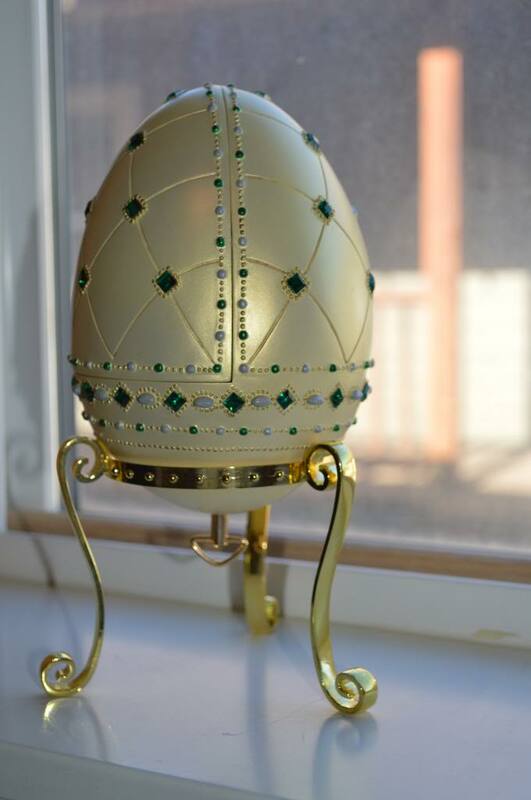 That's a very pretty egg. Lots of detail. 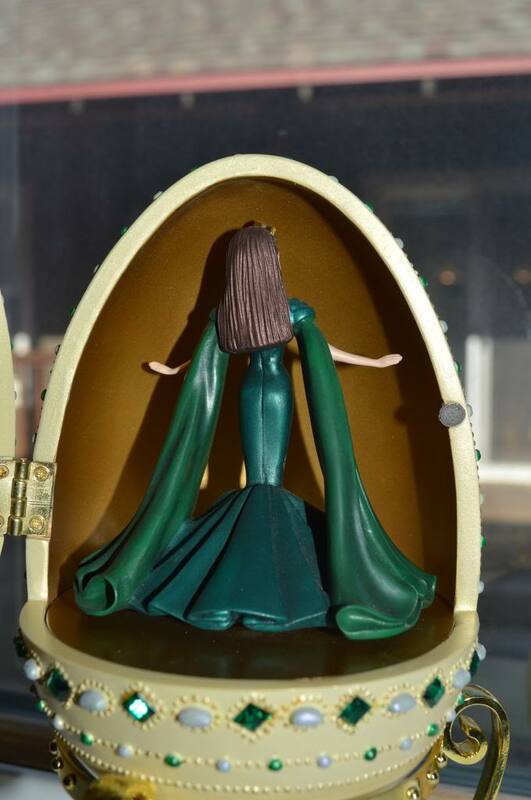 And our little egg opens up to show Barbie! Love that gown! Don't you just love this? And of course, the back is awesome too. So much detail and it looks perfect! Did anyone notice a little key on the bottom of the egg? 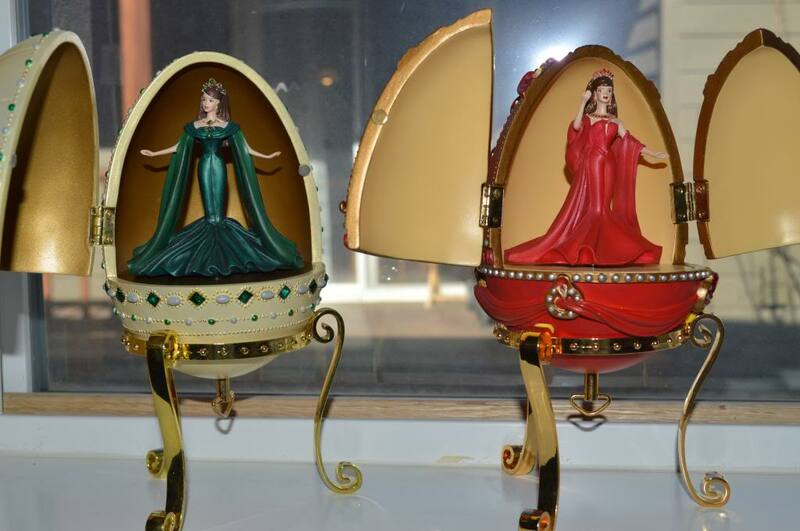 Yes, these eggs are also little music boxes. Barbie spins around as the music plays. Here is the excerpt from the back of the box. 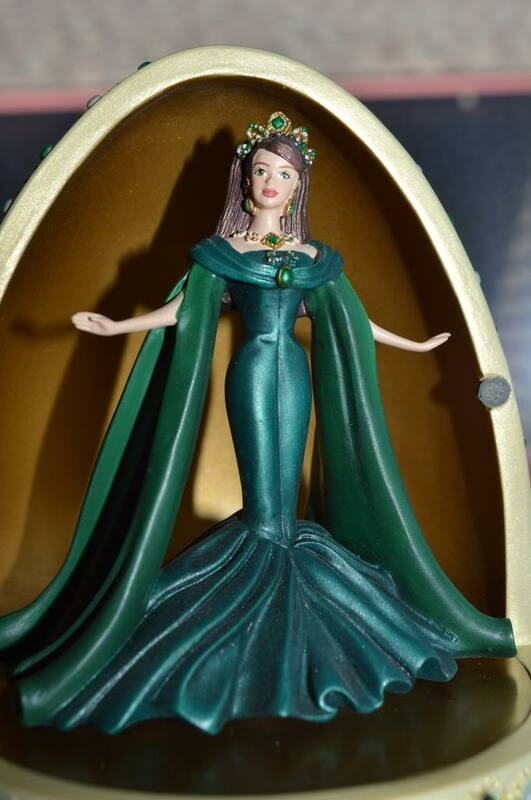 "I am the Empress of Emeralds and the gift I bestow is the splendor inside the emerald's glow." "From this shimmering egg of resin, set upon a golden stand, beautiful Empress of Emeralds Barbie proclaims her royal heritage. Bejeweled with exquisitely sculpted tiara, necklace and earrings, and wearing a long fitted emerald evening gown and matching floor length wrap, her beauty and regal bearing captivate all who see her. 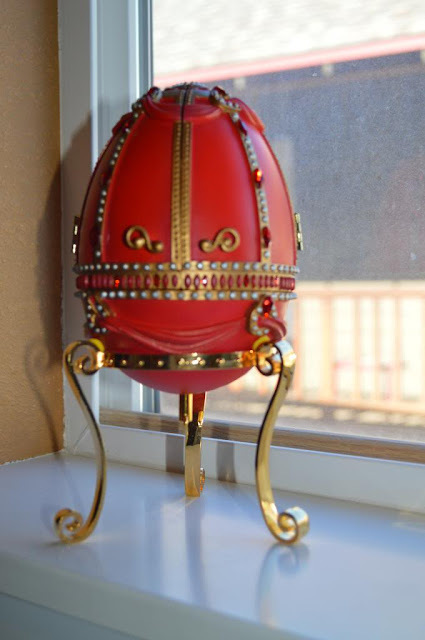 Gently wind the key at the egg's bottom and she will twirl round and round as 'Minuet by Mozart' plays." 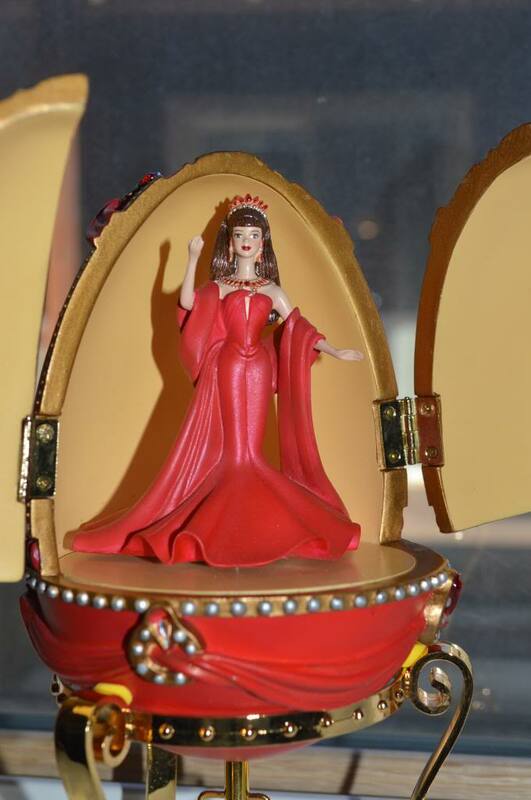 Now I present the Countess of Rubies. Does this one remind you of a little stagecoach? How cute! 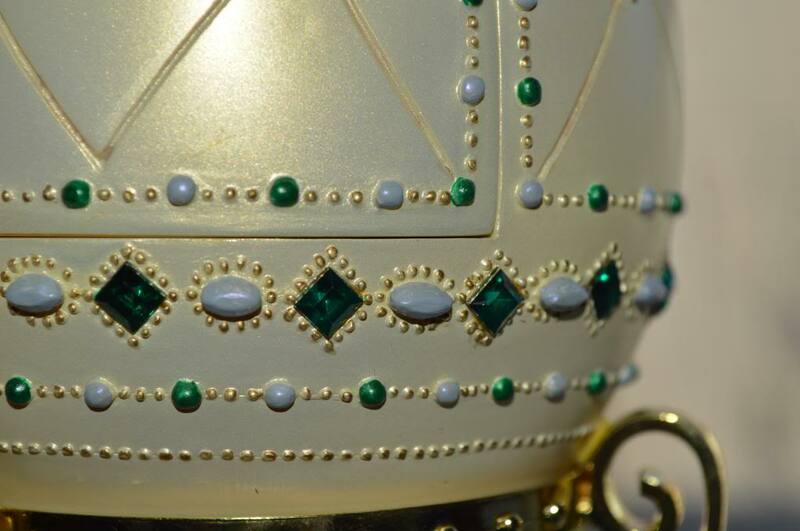 A little more detail went in to this egg. But no more pretty than the last. The top is awesome too! This one opens up a little different. Two doors open to reveal Barbie! This dress is just as pretty as the last. 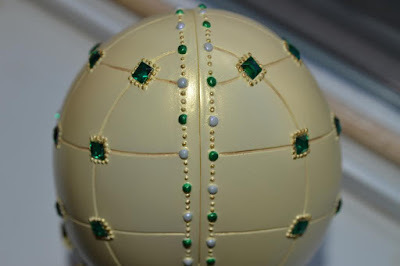 You can see how much detail went into creating these beautiful keepsakes. Here is the write up from the back of the box. "I am the Countess of Rubies, precious and rare; a deep red brilliance is the gift that I share." 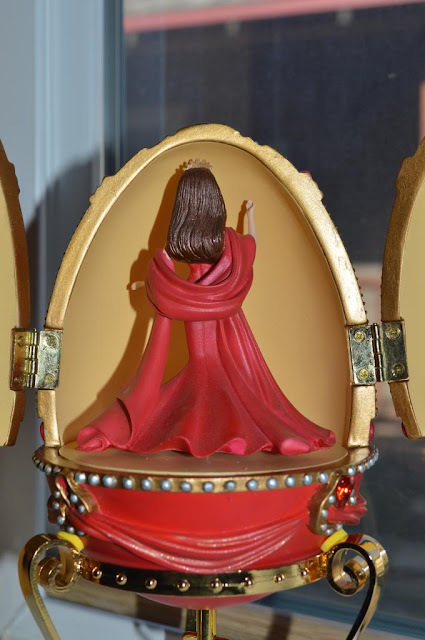 "From this shimmering egg of resin, set upon a golden stand, beautiful Countess of Rubies Barbie proclaims her place as the second addition to the sumptuous court of the Royal Jewels Collection. 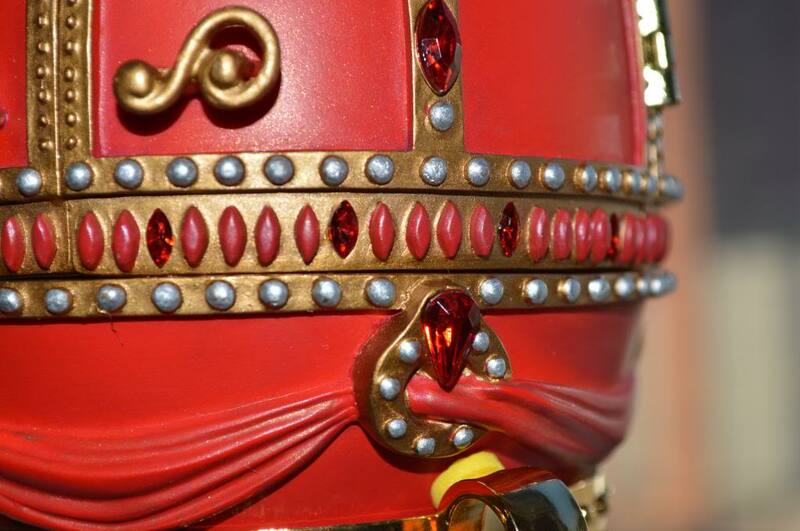 She is resplendent with sparkling ruby-hued accents adorning her sculpted tiara, necklace and earrings. 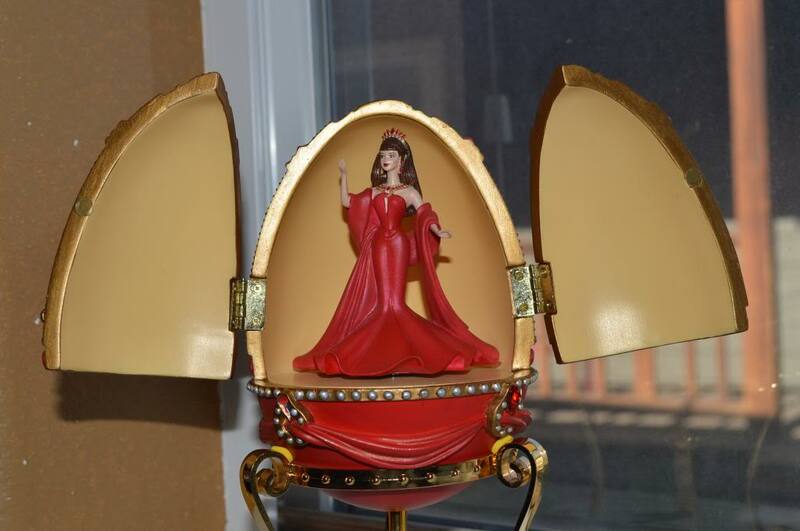 Her majestic splendor is reflected in a regal, ruby red gown. A matching stole lends an air of sophisticated elegance and completes her ensemble. 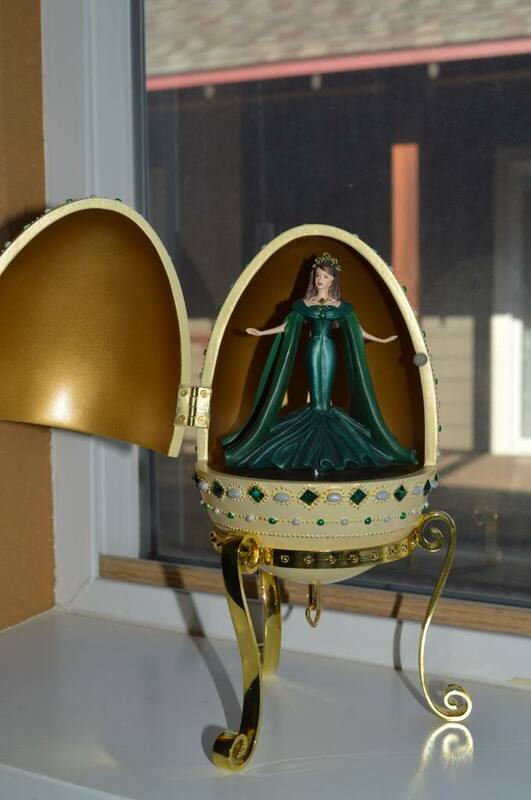 Gently wind the key at the egg's bottom and she will twirl round and round as 'Swan Lake' plays." The two eggs together. 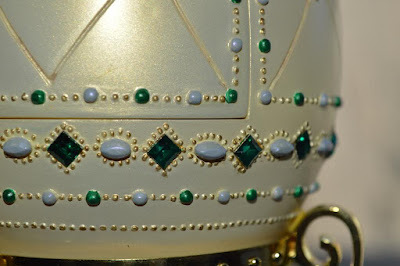 Empress and Countess, Emeralds and Rubies. Unfortunately I don't have a place to display these beautiful pieces of art. I will someday when I have an entire office dedicated to my dolls! It's been such a long time since I have had these out of their protective boxes. I love them now just as much as I did when I first got them. 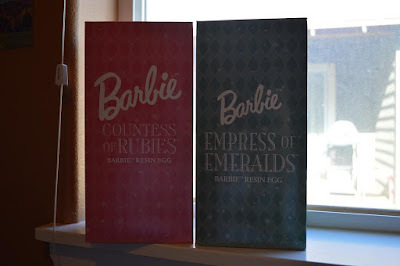 Friends, what do you think of these Barbie eggs? Do any of you have them? Let me know in the comments! Next post coming soon. Until next time! Oh My Gosh! Those are soooooooo pretty! I love the dresses, and that they have awesome names. 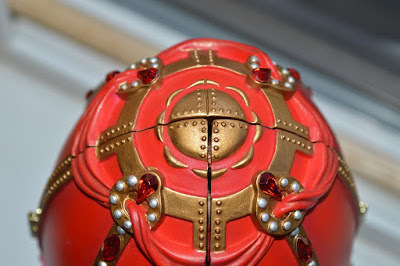 :D they have so much amazing detail! 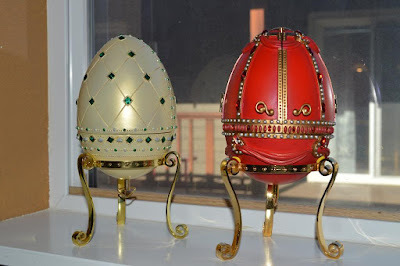 Those eggs are gorgeous, you are very lucky to have these treasures. 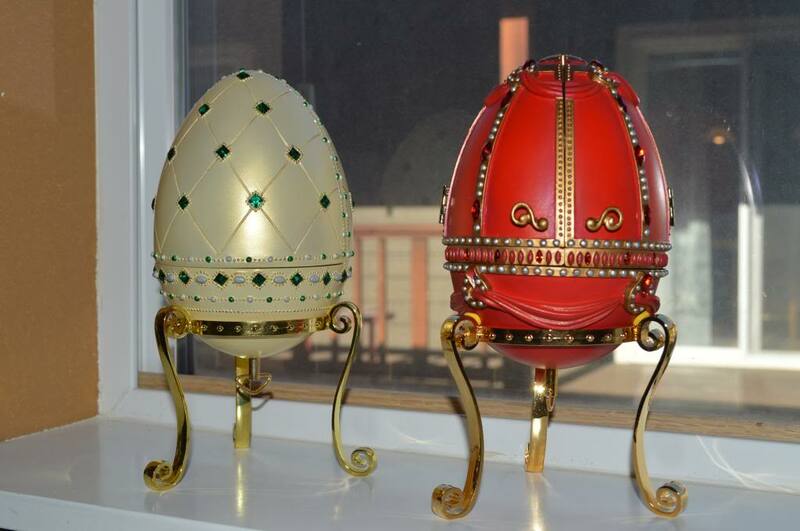 They remind me of the Fabergé eggs of the royal family of Russia. The sculpting of the dresses is amazing, it really lokks as if they are flowing in motion. I don't think these were sold internationally.